Disneyland’s railroad terminal. Photo by John Schreiber. 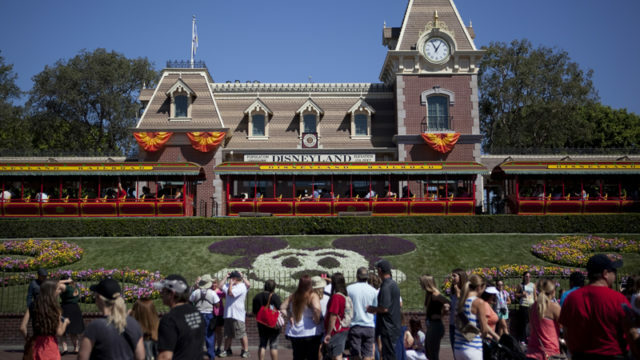 Bring more Disney dollars, if you are planning to visit Disneyland, as prices to enter the Magic Kingdom were boosted up to 18 percent Sunday. Mickey Mouse’s keepers crept in on mice feet, and began charging up to $129 for adults and $123 for children on peak day entrance to the amusement park. The peak day prices are charged on weekends and during holiday vacation periods. Annual passholders will now pay at least $100 more per year per person, except for the Southern California Select pass, which is blocked out on weekends and will go up only $30 per year. One newspaper estimates that in revenue from annual passes alone. Prices for daily admission will ratchet down to $119 for adults and $113 for children on “regular” days. On “value” days the prices will be $109 for adults and $103 for kids. As usual, the Disney Company has Southern California resident tickets on sale, ranging from a combination one day each at California Adventure and Disneyland for $159, up to a three-day ticket good at both parks for $244. The Anaheim resort is crowded on a daily basis, and cannot count on raising its prices to stem the throngs, one expert told the Orange County Register. “Disney doesn’t even have an off-season anymore,” said Martin Lewison, an amusement park business expert, in an interview with the Register. “Disney is in that special rare position where they can raise prices and their attendance won’t dip, or, if it does dip, it won’t be that much,” said Lewison, an assistant business professor at Farmingdale State College in New York.